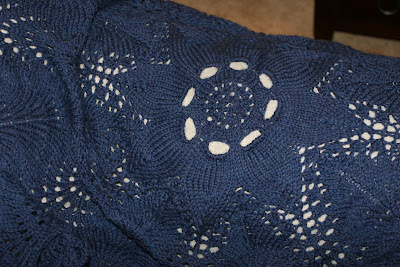 Notes: The star in the center (actually, it looks like a sunflower to me), is really gorgeous and very fun to knit. The rest of it got old after awhile, but I do like the result. Mine ended up being just under 4 feet in diameter. I think it would have been nice to have a wider blanket, but it serves its purpose as a lap blanket. 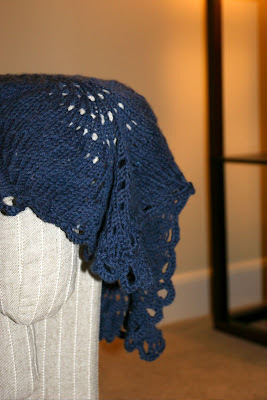 If you are making this, remember to leave yourself plenty of yarn for the bind off--mine took the better part of a whole ball, but the scallops are worth it. This was my first time using the Swish Superwash. It was a little bit splitty to knit with, but it was soft and squishy to work with. It washes up beautifully and drapes nicely. Oh yeah, and the price is right too! 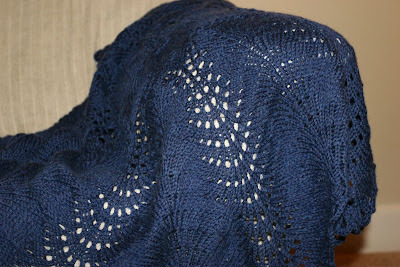 I will definitely be returning to this yarn or its DK version.